Pavi's Platter: Malai Matar Paneer ! Matar (Peas) and Paneer (Cottage Cheese ) makes a wonderful combo as a gravy dish for rice or roti. Unlike the usual tomato based gravies, this malai gravy is made up of onions, cashews, milk and cream. Soak 10 cashews and roughly chop the onions. Heat a pan and add a tbsp of butter , Add cinnamon, cloves, bay leaf and pepper. Saute for few seconds and then add green chillis, garlic and ginger (i didnt have ginger). Then add onions and saute till they become transparent. Cool the onion mixture and then grind them along with the soaked cashew nuts. Discard the bay leaf before grinding. Now add a tbsp of oil and add cardamom and jeera, add the ground onion cashew mixture and a little water. Let it cook for 4 - 5 minutes. Add salt, turmeric, chilli powder and coriander powder and mix well. Add green peas and water if required and cook for 5 - 7 minutes with the pan closed. Once the peas are almost cooked, add garam masala and mix well. Add milk and the paneer cubes. Cook for another 4 - 5 minutes and then add fresh cream and give a stir. Crush kasuri methi and add it to the gravy and turn off the stove. Do not cook on stove top for long time after adding cream. Transfer to serving bowl and garnish with some cream. Serve with roti, naan, jeera rice or any pulaos. See you with another recipe until then happy cooking and happy eating ! Kaju Katli / Cashew Barfi ! 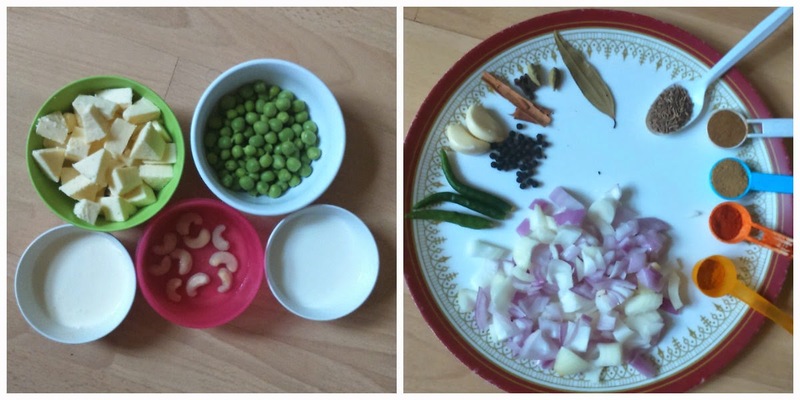 Allam Pachadi / Inji Thokku / Ginger Pickle !